250 GPM Grease Interceptor with 625 LB grease capacity. The Drain-Net APGI Series Grease Interceptor is designed to separate grease, oils, fats, and other sediment from large Commercial and Industrial sources. Made of seamles High Density Polyethylene (HDPE), the APGI series interceptor is lightweight, cost efficient, extremely durable and corrosion free. Non skid 3/4” poly covers with recesed handles are standard, but all units are available with steel non-skid tread plates for traffic areas. The HDPE construction is acid resistant and solids do not easily adhere to the smooth walls, making cleaning effortless. • PVC glued connections are standard. • HD Braces for above ground installation. Special sizes available to fit through narrow passages or existing walkways. Special units also available to meet larger capacities, including systems that utilize series and/or parallel interceptors. Straight through, left, and right hand models available. Shipping: Most units ship in 5 to 7 business days. Customizations such as legs or risers require an extra 2-3 days. We will call you if the shipping quote is not accurate. A liftgate is highly recomended for delivery. All units are custom made in the USA! 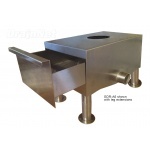 • Bottom of unit to center of inlet/outlet: 45"
• Legs or risers can be added for underground installation. Call for quote. Don't let food solids back up your grease trap! • Increase frequency of grease trap pumping and servicing! • Clogged grease traps, drain backups, and a huge mess in your kitchen! • Potential code violations and municipal wastewater fines! Prevent solids from ever reaching your grease trap with a Garbage Disposal Replacement Unit! (Sometimes called a Wet Waste Interceptor). Click here to learn more!